I have discovered the joy of playing games again. I’ve been working very long hours for a few years now, and I think I was starting to break down a bit (not in a good way). So I have intentionally started to set aside a period of time, when I can, to just read a book or putter on a game or two. What a difference a little down time makes! I can’t say I was ever much of a game person, actually. (Oddly enough, my mom was the same way when I was a kid). I liked checkers and Scrabble while growing up, but I was the only one in the family who liked doing something else besides wrestling and whacking a baseball…. so I used to play games by myself and eventually got out of the habit, especially when I became a workaholic after my first child was born. I haven’t really played any games in a long time, although I have always preferred soltairy games like Solitaire and other card games. I like organizing things and I always feel like I’ve accomplished something when all those messy cards are placed in order and magically stack themselves up into perfect piles! I love the computer card games, but it’s not very fun sitting at the computer to play games when you’ve been sitting there for 8 hours working all day. Up to now, I haven’t found any really good Solitaire app for the smartphone. Until this past week, that is. My SITS Girls pals have recommended a new Solitaire mobile app called “Solitaire Deluxe” by the Mobile Deluxe. You can see the Mobile Deluxe page on Facebook. Mobile Deluxe makes a ton of other games. I LOVE the “The Game is Afoot” game that’s a Sherlock Holmes/I-Spy kind of game. And Mobile Deluxe also makes Jewel Factory and Big Win Blackjack games, among others. The Solitaire app is really great! The graphics are spectacular and there’s no “lag” when you move the cards (that drives me nutty on the Windows computer games). There’s an app for iPhones and Android phones. 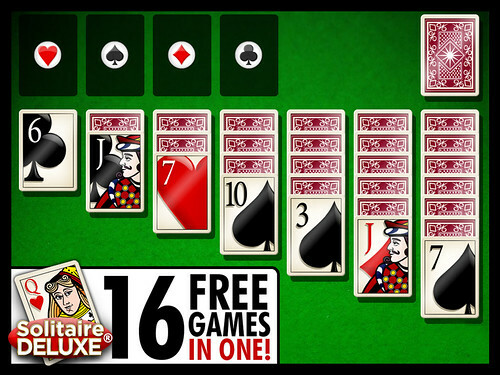 Just search the Apps Store for “Solitaire Deluxe” by Mobile Deluxe. The Solitaire Deluxe app has Solitaire Klondike, FreeCell, Spider Solitaire, plus Tri-Peaks, Chinese Solitaire, Scorpion, King’s Corner, Yukon, and more for a total of 16 card-related games! The free app has ads or you can purchase the pro app to get rid of the ads. Mobile Deluxe with the SITS Girls group are having a nice — a a Rafflecopter giveaway. The prize package includes a Clarisonic PLUSSonic Skin Cleansing System with charging cradle and brush heads, and trial sizes of gel cleanser and skin polish. The contest is VRY easy to enter — gotta love the SITS Girls — so click the link for more details. It was always hard for me in the past to allow myself down time. Up until a few years ago, I was busy trying to save the world..well not literally but it was quite a few people that I pretty much devoted my time to helping. You see, I love helping others but it got to the point where I was enabling them. Yes, enabling! I would give them advice and if they didn’t take it then I would get very disappointed. Many times my advice was for their own good and would help prevent them from going down paths that lead to dire consequences. I always hated to hear about people who have to suffer through things, even the consequences that their actions caused. I would try to rescue people, mostly my family members and a few friends. I would be their nurse, secretary, bank, counselor, cab driver and more. was so profound and true. (Excuse if I wrote the quote wrong, just typed it out of my best recollection of it.) God also was pruning me and it hurt very much. However, it has to be done. I had to learn to properly REST my body and mind…and also most importantly REST IN HIM. I had to learn to live one day at a time. I had to learn to lay down my pride and ask for help. As you already know I have quite a few health conditions that cause chronic pain and more. I believe that I was given these so that I would finally be taught to slow down, trust fully in God, live one day at a time, appreciate the sufferings because in them I learn the most, rejoice always even in the midst of sorrows and so much more.